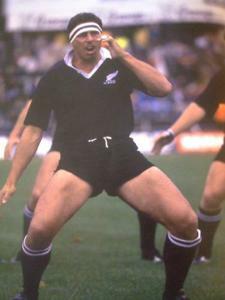 Wayne 'Buck' Shelford, played a big part in reviving the All Blacks haka. In doing this, he and the team captivated our nation. Wayne is my brother so when I was looking at writing a page about the māori haka I naturally thought of him because Wayne, rugby and haka go hand in hand in this country. When I began to write the bit involving him and the All Blacks though it got longer and longer so I decided to devote a page exclusively to their story. I hope you enjoy it. Wayne's claim to fame is that he captained the All Blacks, New Zealand's national rugby team. Apart from one draw, they were undefeated for 19 games from 1987 - 1990. He's the only Captain that can claim that title at the present time. In 1990 his All Blacks rugby career abruptly ended when he was unceremoniously dumped. I can tell you, there sure was a lot of secret squirrel stuff going on there. On his dumping he immediately walked into the history books as a legend. I've even heard people refer to him as 'God'. Wayne's popularity hasn't subsided since… and it's now over 20yrs later. If you happen to be at any event around the world and see a sign in the audience saying, "Bring Back Buck", that's Wayne they're talking about. It's amazing the countries where it has popped up. It's been seen at tennis, cricket, I think even the Olympics, and events not even associated with sports, quite funny actually. … can bring a packed room to a standstill. … is a New Zealand icon. He was intimidating, fearless, ferocious and portrayed your classic 'follow-me-type attitude. … inspired fear in the opposition and ultimate confidence in All Black fans. Tough, intimidating, imposing, fearless, courageous and uncompromising on the field, but humble, strong, fair and down-to-earth off it. He has a real pride in New Zealand, the All Blacks, and the haka (not just the All Blacks Haka though, all of them). And Kiwis fell in love with him because of that. Whew, a person's ego could really get out of control. To me though, he's still the little brother that vomited all over my plate once. That was when he poisoned himself eating tūtū berries up in the bush on Mt Ngongotaha. It's lucky he's here at all because those berries actually killed a circus elephant around the same time. The New Zealand Natives team did the haka for the first time at a Rugby game in 1888. This was in a test match against Wales at Cardiff Arms Park - and just in case you don't know, the haka was carried out prior to the game beginning. From then on the the haka "Ka Mate" (composed by Te Rauparaha, the war chief of the Ngāti Toa iwi [tribe]) performed by the All Blacks became a regular feature at international games. Because of some custom, I don't know what, it was not performed by the All Blacks here in New Zealand itself. Prior to 1985 the All Blacks haka was a sorry affair. The guys were a mixture of european (pakeha), māori and others. Most of the european players had no experience with the haka at all let alone any idea of what it represented, therefore, it was performed badly. Players could be seen to be looking at each other to see what the moves were. The timing was terrible and the moves had no meaning or purpose. The players were doing their best though and people still loved it. When Wayne was approached by a player about doing the haka before a game in Argentina he passed it onto Hika Reid - another Rotorua player - who also wasn't keen because, "… the Pakeha, they don't know what they're bl…y doing." They talked further and when more players said they wanted to do it Wayne said to them, "If we're going to do it, we're going to do it right… perform the haka properly or not at all. Vote on it…"
All the All Blacks bar one voted to do it properly and once they got into it, they got into it. Big time. They went into training - for the haka. Hika and Wayne taught them what the haka was all about and the guys began to get a sense of pride in doing it well. It helped that it is a huge psychological booster for going into a game. It would pump them up like nothing else, not to mention intimidating the opposition. Wayne laughs when talking about teaching some of the European (Pakeha) members of the team. About how they couldn't get some of the movements and they would do a women's movement instead of a man's. And how their timing sucked too. Once the team had the haka up to a high standard it made for electric viewing. New Zealanders were sold. I love this description from Mike King, a well-known New Zealand comedian, "They took it from a whole lot of white guys dancing at a disco and turned it into what it should be…"
And this from Willie Jackson - broadcaster and political commentator, "And then all of a sudden, this Buck Shelford came along and introduced rugby to Mana Māori. He changed it overnight. He captured not just Māori, but the country's imagination." New Zealanders began to clamour for the haka to be performed by the All Blacks at the home games after this. If you remember, it was still performed only at International games overseas. By the time it got to the first rugby World Cup in 1987 - held in New Zealand and Australia - the public pressure was immense. Talks were held with our māori elders (kaumatua) and finally permission was granted. The New Zealand All Blacks made it all the way through to the finals against France in Auckland, NZ. When it came time for the All Blacks haka, with Wayne leading out front, everyone in the stadium went mental, apart from the Frenchies that is. It was unreal. And to top it all off we won, 29-9. New Zealand WON. Woo hoo! Apart from the All Blacks Haka, I've noticed that a lot of people still search for information about Wayne (I've never called him buck although my other brothers do). So if you have a specific question or query, feel free to ask as I'm happy to help out. Just use this contact form. If there's enough interest I will add a Frequently Asked Questions section. My brothers are rugby nutters. They get very vocal and animated when they talk about the ins and outs of rugby (at home, out at dinner, at weddings; no place is sacred), so much so that they even get me enthused. Wayne and one other brother, Darrel, are both heavily into coaching. Wayne does a lot of freelance coaching both domestic and worldwide and Darrel's with the NZ Sports Academy here in Rotorua and freelances as well. The academy trains young guys from NZ and from around the world to become professional rugby and rugby league players. They also coach coaches on how to coach (bit of a tongue twister). Wayne and Darrel's idea of a perfect life is to fly in (wherever) and coach, whether it's players or coaches. It's funny what lights people up!